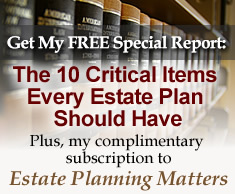 Do Your Clients Have a Current and Comprehensive Estate Plan? | The Levin Law Firm - Philip Levin, Esq. Do Your Clients Have a Current and Comprehensive Estate Plan? Estate planning often includes provisions about how clients can leave a lasting legacy beyond the assets which they own on their balance sheet. A client’s estate is made up of everything they own, which includes personal possessions as well as homes, cars, securities, bank accounts, life insurance, retirement plan accounts, and more. For many clients, their legacy and “wealth” comprises much more than just their financial assets. It often includes memories, stories, and non-physical assets that make up their personal legacy and which clients want to convey to their friends and loved ones. Of course, the traditional purpose of estate planning is to give clients control over how their estate is distributed to the people and/or charitable organizations they care about, and to preserve their legacy for the next generation and beyond. If you have any questions about how a comprehensive estate plan can protect your clients and their families, or if there is a specific topic which you would like us to cover in future editions of Estate Planning Matters, just hit reply and let us know. If you or your clients do not have a comprehensive estate plan – or have one that needs to be reviewed and updated – make 2014 the year to get this done by calling The Levin Law Firm to arrange a meeting.